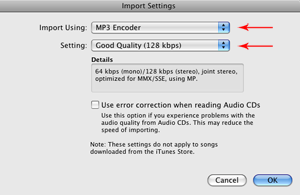 The purpose of this tutorial is to help you convert your m4a sound files to mp3. It is possible to use this tutorial to change sound files to several other extensions. Launch iTunes. Go to the desktop, double click the Applications folder, and find iTunes. Similarly you can find the iTunes icon in the dock. 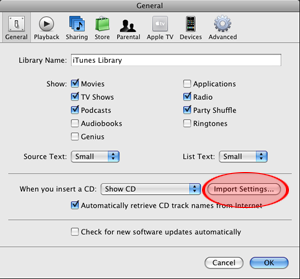 Put in your CD containing the sound files you want to convert, or load up the sound files from your disk into iTunes. You can do this by going to File > Add to Library and simply browse for the files you would like to open. 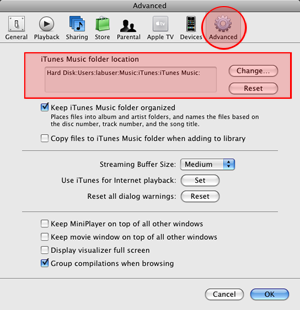 Before you start converting your sound files to mp3, we have to change some preferences in iTunes. Go to the menu and click on iTunes > Preferences. 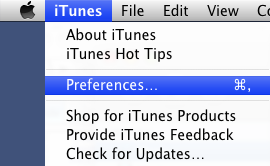 The Preferences window will pop up in the "General" tab that looks like the following. Click on the Import Settings button near the bottom circled in red. Depending on what type of quality you want, you may want to choose something different than "Good Quality." For example, if you want high quality sound files, choose "High Quality." For more advanced users, you can choose to customize your settings and modify the stero bit rate, sample rate, and channels. If you want to change the directory of where your files will be saved, take the following steps. If not, this portion of the tutorial will show you were your files will be saved to. Go to iTunes > Preferences and change into the Advanced tab at the top-right hand corner of the window (as shown in the red circle). Your files are currently saved in the directory listed in the red box.